1. Preheat the oven to 200°C, gas mark 6. To make the topping, combine the Parmigiano Reggiano, soft cheese, oats, seeds and chives, and season. 2. 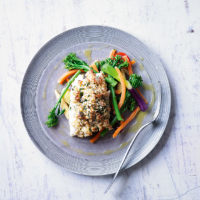 Place the cod in a roasting tin and press the crumble on top. Roast for 15 minutes until just cooked through. 3. Meanwhile, heat the oil in a frying pan and fry the stir-fry mix for 3-4 minutes. Top with the cod.